Leadership Spokane created the King Cole Luminary Award to recognize exceptional servant leadership that lights the way in the community. In March 2013 at the Leadership Lights the Way Gala, the first annual award was made posthumously to King Forrest Cole. 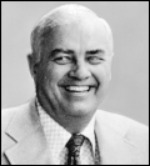 Cole was the "father" of Expo '74 which revitalized the downtown, resurrected the Spokane River environs and led to the creation of dozens of other initiatives, including Leadership Spokane. As President of Expo '74, Cole was its main spokesman and promoter, but his real skill was his ability to get people to come together to achieve the impossible. Nominations are being accepted until October 31, 2019. Thank you.